Just over a month ago, I launched a free book promotion for my best seller at the time ‘Your First Marathon‘ on this Blog. I had taken part in a couple of KDP’s FREE promotions prior to this one, but the downloads I received for the Marathon Book were twice as high in comparison. I think the downloads from you fellow readers were a huge part to play in that. Thank you so much for your help! I wasn’t sure what people would think of me doing these promotions on the Blog, and I was surprised not to receive one negative comment on it. The comments and emails I received were all positive and it seemed like people were either genuinely interested to help out, curious to see what I had in my books to see how I made money or to a lesser extent, interested in running a marathon. 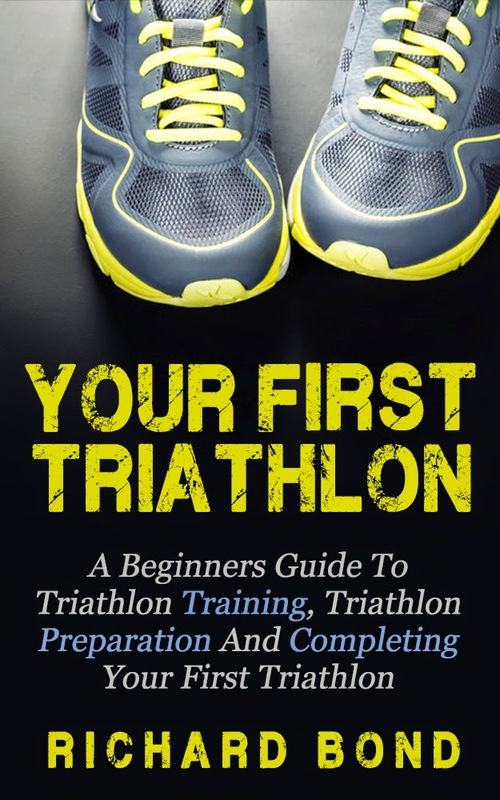 I’m running another FREE book promotion on Amazon for Richard Bond’s second book – ‘Your First Triathlon‘. You don’t need a Kindle device to download the book, you can do so with the smart phone or computer. If you’re interested in learning about completing a Triathlon, what content I put in my books, or just wanting to help out, I would hugely appreciate you downloading it. If you decide to download the book, and find any value in it, then please feel free to leave a positive review. Downloads and Reviews help the books rank higher on Amazon and give other customers a better perspective of what it’s all about. As I discussed on my previous promotion, the more downloads it receives, the higher it ranks on Amazon for people searching for Triathlon books. More people are exposed to the book and you get more reviews. When the promotion finishes, it should make more sales than what it was making before hand. My Marathon book sales increased after the promotion ended and I’m hoping the same thing will happen again with this book. In the 4 weeks prior to the promotion (most of March), the book made approximately £27 and had 2 x downloads from Kindle Unlimited customers. In the following 4 weeks after the promotion (most of April), the book made around £36 from direct sales and had 12 x Kindle Unlimited downloads. At the end of each month, Amazon pay me a cut of revenue for the downloads made with Kindle Unlimited for my books. I made £9 more in direct sales (33% increase) and 10 more sales from KU downloads (500% increase). I hope this can be replicated! One of the biggest learning points I was taught in my Kindle course was the importance of authority creation or building a brand around a topic/niche. Once you find a topic that sells well, keep the pen name, design covers that look similar and produce books around that area. People tend to buy the other books in the series or even the whole lot. At the same time you’re also building more credibility for the customer in that area. For example, if you have an isolated triathlon book for beginners, like mine, it might generate decent sales. But, if you sell the triathlon book, alongside an Ironman Triathlon book, and a Nutrition for Triathletes book, you’re much more likely to boost the sales for your beginner book, as well as total sales across the board. People will be more receptive to hear what you have to say. You’re also widening your readership to three areas rather than one. People might buy the Nutrition book, because they liked the Triathlon beginner book, and the cycle continues with all the other books you produce. Its impact is similar to compound interest in that regard, and I’ve noticed this benefit with other pen names I have in certain niches. I’ve been a beginner marathon runner and triathlete, so I knew the topic well. I wanted to publish two books that helped people like me in that position. I have a couple of other books that are being created for Mr Bond, and I hope to continue developing the readership and sales in that niche. The progress has been halted a little but I remain positive for the future…..
Once you find a good writer, and they’re hard to find, you want to cling onto them and never let them go. My Mr Bond writer has been told by his doctor to write less due to a strain he has. He wants to finish the book he’s currently doing for me, but it’s taken him a long time (understandably) to complete it. After that we’re going to part ways so he can get back to full health. It’s such a shame because I’ve really enjoyed working with him, and I know he’s struggling with not being able to write. He enjoys the process, and it earns him a nice side income. I’m hoping that later this year, we’ll be able to team up again and develop the Mr Bond niche further, but I hope he gets back to full health more than anything for his own well being. It’s fair to say I snapped his hand off! This alone should help me get towards the 50 books I want to publish in 2015, but I don’t want to stop there. I have other plans…..
My aim is to continue publishing books that other people are writing for me. The formula is working, so why change it! I enjoy the writing process first of all. I don’t think I’m a strong writer right now, but in time I’ll improve – as is the case with anything you enjoy doing regularly. I edit a lot of the work that comes back to me, which is my choice, and it can be quite time consuming. I find myself thinking about how well my version of this topic would do in comparison. One of the benefits to writing yourself is full autonomy, no parameters, and no cost. I can write 20,000 words on a topic and not worry about the money it will cost to pay for the work. It’s tough when someone writes 10,000 – 15,000 words and you want to change a lot of it. I’m interested in putting my own work out there on Amazon. I plan on covering topics/niches that I’m passionate about like Early Retirement, living frugally, investing, health and fitness etc. Perhaps I can create my very own niche around Huw or FFB40?! For the last 3-4 weeks, I’ve been writing my first book, which will be about my life, how I got out of debt, how I changed my life, how I budget money now and live on less than £10k a year to fund my early retirement. I’d like to release it by the York Gathering in August as it’s 3 months away, but we’ll see how I get on. I don’t know how it’ll be received. It could be a giant flop or a minor success. Part of me doesn’t really care about the outcome. I’ve learned a lot from doing this process, and I still have a lot more to learn. Watching Jason from Dividend Mantra release his book was very inspiring and gave me a much needed boost. Perhaps one day, when I’m FI, I could continue to write for a living on this Blog, and release other books on topics that I love. That’s the outcome I’m really after. I plan on writing more specific posts on Kindle in the near future, and I’ll continue to keep you all updated with my progress. Thanks again for all of your support! I hope you all have a great Bank Holiday weekend! Are you interested in Downloading the Triathlon book? Do you want me to cover any areas of Kindle Publishing on this Blog? What do you think about my book idea? Are there any other topics you’d be interested in me writing about? Are four questions at the bottom of a Blog too much? How about five? Good luck, Huw! Glad to hear the promotion went well for your Marathon book. Long may its effects be felt on your sales! I have to write a lot for my job. As part of this, I have a simple calendar (just dates, nothing more) and cross that day off if I wrote my target (like yours at 500 words a day). If I do twice as much that day then I will double cross the day. The idea is that I don't want to break the chain of crosses so it motivates me to continue to write at least 500 words a day–no matter what. It works for me! I have downloaded your book and have read it this morning. The one thing that strikes me and makes it stand out from a lot of other Kindle books are the photographs. They really add to the book and make it more professional. I admire you for writing your own book; I struggle to string a paragraph together never mind a whole book. I would be very interested to read about your financial journey although I would guess a large part of it is on here in one form or another. I grew up on a farm in the Yorkshire Dales and was up early every morning doing various chores before going to school and again when I returned. Today I still get up early and do my chores before going to work although my chores now do not include milking cows or mucking out the calves. I can really relate to what you say about those early starts to me those 2 hours in a morning are when I get my best work done. Good work Huw. It's awesome to see the work paying off on the books. Out of interest, do you need to pay to put a free book on there at all? That sounds like a tough schedule! How much have you written so far? I have been getting up an hour earlier than I used to for a while now. Either to do a bit of writing or some study before work. I do find it productive, but it can be knackering! Thank you for the kind words. I'm glad you like it! Sometimes I struggle to put sentences together never mind paragraphs. 🙂 I've already question my decision several times since I've been writing myself. "Do I really want to do this now? ", "Will anyone actually care or buy this thing?". There are a lot of people out there making a very good living from self publishing, and I feel very strongly about FI and ER. So I thought why not. I'm not sure if I'll stop at one book or write 20, but I've promised myself to put one out and see how it goes. There will be sections in the book that are included in this Blog, but there will be large chunks of it that I haven't shared on here. Hopefully it will be a nice balance of the familiar and the new. There's something magical about that time in the morning. I can't quite put my finger on it but it's hugely satisfying. It's similar to running in the rain or staying late after work. You're in the minority, you're on your own, and at one with the task at hand. Pure focus. Some people might repel at the thought of getting up early but I love it and wouldn't change it for the world! Congratulations on getting your first book out there Richard. It was a special moment for me, as it must be for you. I wish you every success. I've already downloaded a copy, and from my early scanning it looks very good. If you ever have any questions about the process, please don't hesitate to contact me. I hope my progress from the promotion continues to remain positive for some time. Thank you for the support! I like your calendar approach to marking off days and keeping a winning streak. I might give that a try. I like trying new things out like that. I currently write my goal in my diary every day and cross it off in there. I then report on how I got on with my daily tasks in my weekly review on Sunday. It doesn't have the visual link like you explained, but it's been effective so far. Thank you for the idea! Thank you very much! So far the work is paying off. I hope I can continue to benefit from it for some time yet. I certainly don't need to put a free book out there. You can do it for 5 days within a 90 day period. It's advised to do it from the courses I did and I've found it to be more beneficial than not so far. It might sound tough Mr Z, but like most things we put ourselves through, we are so much more capable than we realise, and we quickly adapt. That's exactly what's happened with waking up at 4.55am. It was difficult for the first week, but I'm already used to it. I've written just over 30,000 as a brain dump, and I have more to write. I won't include everything I've written, but I want to get everything down before I start picking out the nuggets and pearls – Gulp! An extra hour in the morning will make a difference for sure. I found that I didn't quite make the progress I wanted to. I tried cramping in everything. Two hours works great for me, but I'm sure one hour is just right for many people. I also train in the evenings, so I try to maximise my morning time to do my writing so I don't have to cramp it into the evening. I wish you all the best with your studying and writing. Thanks for stopping by! My pleasure. I need something visual for it to work as well as something which compels a daily routine no matter what. It helps that there is a little competitive element to it as well (even if it is with yourself!). Good luck with trying it if you decide to. Do tell us how it goes! I am always fascinated to hear other people's experiences. I think it's a great idea. I'll keep you posted with my progress! Great work Huw – very interesting to see how the promotions (and downloads) help with your sales! Good luck with this promotion – I have downloaded to help out! As for waking up early – I'm a night owl so pretty much ineffective brain wise in the morning! Think there's just about enough brain capacity to get me showered, dressed and to drive into work but I don't think I'm really awake even then and that's waking up at normal time (7am) , never mind getting up 1-2 hours earlier! I'm likely to do productive stuff late in the evening, ie when you're tucked up in bed! I'm glad you found it interesting. I wanted to share my results off the back everyone's help. I hope this one works out just as well. Ha ha. I think I'm in the minority to be honest. I come across more people who like to stay up late at night than get up early. To be honest, the time is irrelevant. It's all about having that time to yourself to get things done and to be creative etc. Thanks for providing more info on the ebooks. Found it really interesting! Unfortunately I missed the free download deadline… D'oh! 3. How do they get paid? Is it a cut of profits on the books or up-front fee's? Apols if you've already been over this before and feel free to not answer any if you'd rather not say? Cheers and good luck for continued success in your Kindle empire! I downloaded an app the other month that was for that exact purpose called cross calendar, but I deleted it as I didn't really have any daily goals to acheive at the time! Check it out, it's on Android and I would have thought something similar on iOS as well. Really interesting post. I'm looking at Kindle publishing as a method of passive income, but I am slightly confused: How do you find authors who are willing to write for you? 1. I wouldn't chose to be a ghostwriter personally, but some people prefer the anonymity, the guaranteed payment over the unknown earnings, they might not know how to publish, and some just love the writing process. 2. I can give as much or as little as I want. I tend to give a lot of structure to help them with the research. I will give my more experienced writers less so. I want my books to stand out against others on Amazon and include certain chapters. I could ask a writer to complete a book on triathlons for beginners. I'd guess that the writer would want some direction, but on the other hand, some might be more comfortable with having a free reign. I'm asking my team to write, and if I provide the structure for them, it gives them one less ting to worry about, and they can focus on writing/research, and they know what to deliver. 3. The generalised rate you see a lot is $10 per 1,000 words. You're free to offer a bonus/tip too at the end of the work. Once you've paid them for the writing, that's it. They don't get any profits. It's all yours! I have no issue answering questions on this process and I hope this helps. Yeah, I don't think an extra 2 hours in the morning would be needed for you! I try to work like you where I put the work in early and then relax later. Delayed gratification is the way forward! I'm totally comfortable mugging off the people that run the course! 🙂 I'll rephrase that, I'm not mugging them off so I don't feel any guilt for it. I paid for the information, and as long as I don't use their material for monetary gain it isn't a problem. I plan on writing more about it, and I've said that for most of 2015 and we're in May. What am I waiting for? I'm still learning this process, and the process is huge! It's not difficult, but there's a lot to cover. I'd have to do bit sized chunks and it would take me away from actually doing the publishing and writing my own book in my free time. Back to my first point, I'm learning all the time. I would recommend the course that I did to anyone because it's got me to where I am, and I'm going to easily get my money back and I have a lifetime membership to that information, but I do things differently to what the it suggests. I treat my book lengths, writers, and book covers differently to what they suggest. I suppose what I'm trying to say is, I want to feel like I'm more successful at this before putting all of this out there and I want the time to dedicate to doing it. I'm much closer to feeling like this than ever, but my spare time is still spent writing and publishing. Feel free to ask any questions and I'll do my best to give you an honest answer. Thanks again for the support and interest! Thanks for stopping by. I'm glad you like it. I use a freelance website called Upwork (formerly known as ODesk). I wish you the best of luck! Excellent answers as usual Huw, thank you so much for such a detailed reply. I feel bad you wrote an hour long reply and lost it! I always copy the reply into the copy/paste buffer before posting especially on blogger (that's another thing that wordpress seemingly does (ever so slightly) better than blogger, if you lost your comment you can press back and 9/10 times it will magically reappear. Anyway, some very interesting stuff in there! I still can't get my head around it, that is surely such a poor hourly rate after you factor in research etc. Anyway if they are up for the arrangement then everyone's happy I guess. So you can't rely on getting something done, you just have to roll with the punches. It's better than nowt obviously! To be honest you could probably just slightly edit what you've written above and it is pretty much an instant intro to kindle publishing FAQ post? I am sure most people would appreciate even just some basic info on it, you don't have to go into too much detail I don't think on every single post you do to make it worthwhile reading. You can obviously restate the caveat about not being in the game for that long at the start or end so you don't feel like you are misleading anyone. Anyway just an idea, having spent all the time writing the reply for little ole me maybe expose the info to more readers in a brand new post I reckon. Cheers! No problem at all. Thanks in turn for your response. I appreciate the advice as well. Don't worry about the comment, stuff happens. Although different words were coming out of my mouth at the time! Making use of the time on the train makes sense. I think I would do the same thing. With regards to the Kindle FAQ, perhaps I should just go for it. I appreciate you asking for it, but it made me think about my response. As I was writing your reply, I thought "why don't I just write more on it, this sounds lame", even if I did it in chunks. Time is a factor for me currently, hence the lack of consistent posts and commenting on other Blogs, but I WILL get around to it soon. Thanks as always for the time you've spent on your replies. I appreciate your effort and interest! Hi Huw, i want to thank you for some ideas i just read. I published my first book after 17 years (i know…) but i will try to do my second one for Kindle too. Let's see what will happen. I wish you the best of luck with it. Please keep me posted. I love to hear about progress.